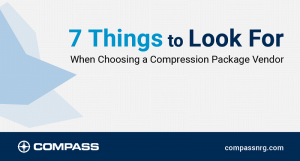 Within the gas compression industry, Compass is built to stand out from the crowd. Some companies might have a high-profile engineer or two, others a first-class rentals group, and still others a top-rated service team. Given the diverse skills and experience needed to fulfill clients’ needs, it’s not often you see a team excel across the board. Compass President, John Forgeron, believes if any link in the chain is comparatively weak, it’s bound to show in the quality of the work, and in the customer’s experience. Which is why Compass aims to deliver a high level of technical expertise, industry experience and customer commitment from each and every employee. Beyond outstanding skills and deep experience, Compass wants all of its people to embody personal qualities that are sometimes undervalued in a technical field. For Compass, one-off projects come with the territory, with many companies spreading out their compression needs among multiple vendors. Compass’ compression professionals work closely together to deliver successful projects and a positive experience for clients. This approach often turns one-off projects into longer-term partnerships, which can streamline clients’ operations and save them time and money.